Like most children, when I was young, my parents installed a roller blind in my bedroom to keep the bright sunlight out and to keep me sleeping in for as long as possible. It was one of those spring loaded blinds where you yank hard on the bottom rail and the blind quickly shoots up to close. Over the years, that thing got more and more wretched, and the springs gave loose, and eventually was just a ratty piece of vinyl hanging over the window. It never ceases to amaze me how many parents still perform the same ritual of the roller blind for their own toddlers- especially once the summer sun starts peaking through. I've always been- and still am- repulsed by those white vinyl shades with the spring loaded gears that just don't work right. But, there is a plethora of roller blind options out there, and I think there are some to suit any taste. -As hideous as the vinyl roller is, it actually works, and nothing beats it. If you find yourself purchasing one of these lovely beasts- consider purchasing it in a fun color. And contrary to popular belief- the white blind will block just as much light as the black blind will- they are the same thickness, and perform just as well. If you find yourself restricted to the white, try unrolling the blind and paint it! Get crazy and inject some fun patterns with stencils! -Roller shades are also available in fabric. Most fabric blinds do not black out, and exist for partial shade and to dress a window up. Many options, colors, and patterns exist in the fabric style, and are a more affordable option for a soft look. 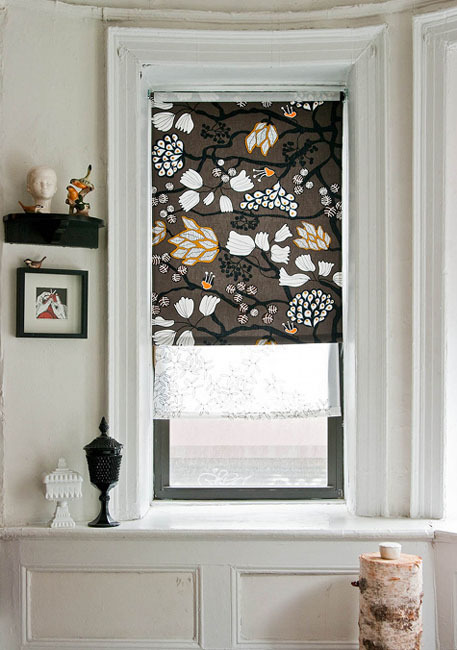 And for a great project, make your own roller shade! I'm sure there's some quirky fabric you've come across that you want to incorporate in your home- purchase a DIY roller shade kit, and attach the fabric onto the fittings for a personalized look. When purchasing roller blinds, here are Steve's 3 Tips for Success! -Say NO to spring-loaded. ALWAYS opt for a chain mechanism instead. The spring loaded version will ALWAYS break- it's only a matter of time. -When choosing a chain drive, don't settle for plastic- get a metal chain for the same price. -A valance really isn't necessary. Most valances cheapen the look of the blind. Keep it simple.